‘Well, you are mistaken my friend, this wall will dry first because it’s on a northerly aspect and it has been heated by the sun all day’. Our debate was interrupted by a friend who had returned from the bar with a fresh round of beers. ‘But what about the game?’, he replied. I looked up in time to see Dan Carter move in to kick a goal 55 meters out from the Australian goal line. The most prolific try scoring team in rugby is opting to take a shot at goal from within their own half. What a disgrace! I look at my friend, tell him it’s 9-3, and get back to my paint drying discussion. As my friend begins to argue the different drying times of enamel and acrylic paint, my mind shifts back to rugby and its decline as a modern day spectacle. It has become the most boring of all the football codes and unless amendments are made to the games structure it will further slide into oblivion. Rugby is played in private schools, colleges and universities. When it was an amateur game it was the alumni of these institutions that supported and fostered the game. This allowed the game to grow and flourish internationally and secure a ‘world game’ reputation. Due to its ties to educational institutions, rugby harbors many educated and influential people among its ranks, who provide an excellent network for budding professionals. 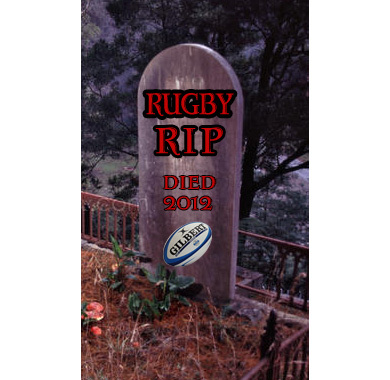 This firm history and white collar pedigree has fostered an elitist mentality among rugby supporters and made them impervious to any criticism of the game. It is this attitude, the game’s firm roots in the Northern Hemisphere, the ARU’s inability to evolve from its amateur status and the fear of mimicking rugby league that make it resistant to change. I believe these, in addition to the following reasons, are the main causes of rugby’s decline. Around 2004 is when I started to notice the decline of rugby union. Many will argue that rugby was alive and well all these years ago, but I had noticed that a lot of negative play was predominating tight contests such as test matches or super 12 matches (NSW vs Queensland). There was also an emergence of several place kickers that could kick goals from all over the field, even from inside their own half. I would constantly point out to my rugby union friends that the game was stifling and, compared to rugby league, it was a boring. They would staunchly stand by their code. The most common response I would receive is, ‘Well, don’t watch the game’. Telling me to not watch the game is sound advice, but reeks of ignorance and arrogance. To their credit, their advice is now being heeded and people are no longer watching Rugby and are opting for other sports to watch. It is this refusal to acknowledge the game’s flaws and their blind support of this ailing sport that has adversely affected rugby. Another common statement is that rugby union test matches are better than anything league could produce. That was once the case, but is no longer. About 5 years ago I timed the amount of actual playing time in a rugby union test match (Aust vs Eng). Over 80 minutes of rugby and we only saw the ball in play for 28 minutes. I did the same for league and the ball was in play for 72minutes. And the rugby administrators wonder why rugby is struggling. Over the years most of my friends have all stopped watching rugby. Even they had to concede the game is painful to watch. The amount of goals kicked, lack of tries and huge amounts of stoppage time encourages the watcher to switch channels. The problem isn’t that rugby has declined, it is that the other football codes have evolved and in this day and age of pay television, another, better option is one button press away. World rugby is controlled by the IRB, located in Ireland. The IRB is an organization that is renowned for holding onto the past and resisting change. If the IRB were a car company, they would still be manufacturing FJ Holdens, because after all, why change. In fairness, in 2008 they introduced the Stellenbosch rules after much discourse. The problem with these rules is they were like putting a new set of tyres on the FJ Holden. They were an improvement, but they didn’t quite fix the problem. The Stellenbosch was a stop-gap solution that was meant to appease both styles of Rugby, the old school in the Northern Hemisphere and the new school in the Southern Hemisphere. There was much resistance from the Northern Hemisphere where contests are based on field position and not scoring tries. They play a conservative game focused around the forward pack and rely on goal kicking to score points. The Southern Hemisphere play a more attacking brand of football where the forwards are more mobile and the backs look to score points from tries. The rules set to change the game but they weren’t drastic enough to have an influence on how the game is played. In contests between the North and South, the game was still stifled. The game still rewarded negative, safe play and teams that adopted an attacking approach would be at a greater risk of losing. This meant that when a game had a lot of pressure associated with it, like a test match, the contest would be played conservatively even if both sides had strong attacking prowess. This is my point. The crowd comes to see the world’s best attacking sides play and all you see is goal kicking or worse, drop kicking. The Stellenbosch changes were a start and I applaud the IRB for making these first steps, but they needed to be followed by further changes. A furthering of the rugby evolution. This didn’t quite happen and the game stagnated once again. In Australia Rugby has to share centre stage with three other football codes, Rugby League, AFL and Soccer. Rugby league and AFL are predominantly played in Australia and this is where the governing bodies are located. This means both codes can be closely scrutinized and if a change needs to be made it can be implemented with minimal red tape. With every change to the games rules, there is always criticism from former players or administrators stating that the game is changing for the worse. Over recent years, a common gripe is that AFL and Rugby League is getting quicker and this is resulting in the bigger man becoming obsolete in both codes. This may be a legitimate claim, but in all football codes it is about the spectacle, the fans and the quality of the game. The evolution of the game is determined by the fan base. The fans increasingly want fast, quick, dynamic action. Rugby league and AFL realize that they must listen to the fans because it is a limited, tightly contested market in Australia. Constant monitoring of the codes ensures that the fans get what they want. Change is never easy, but it is necessary. Rugby union shows little to no respect for their fans. Many times over the years I have been sitting at a Brumbies match and they will show some impetus in attack only to receive a penalty and have a shot for goal. To not go for the try may make tactical sense, but it rewards the attacking team for taking the safer option. A common occurrence that results from this is the home team booing and jeering their own side. Are the administrators not watching this happen? HOME TEAMS BOOING THEIR OWN. I have seen this happen a number of times over the years in NSW, ACT and Queensland. Even if a team is down 20-3 before halftime, they will opt for the shot at goal much to the dismay of the crowd. I have actually seen Australia taking goal kicks against the Barbarians side instead of trying to score tries. WHAT??? Wasn’t this designed as an exhibition match? It is a disgrace. An exhibition by definition is ‘a display or demonstration of skill’. I might have to send this definition to the IRB and the ARU. The purists will tell you that rugby is not about scoring tries, but about field position. I disagree, that is what rugby used to be about. The modern day crowd wants to see tries. I don’t want to watch Rugby to see one man constantly kick for three points. If I wanted to see a kicking display, I would watch soccer. Nine times out of ten the kick for goal will be the first option in rugby union, which is anywhere from 60 meters out. So this means unless you start your attack from within you own half and by some miracle not receive a penalty, you may, if you are lucky, see a try scored. The rare occasion a try is the preferred option is the last 5 minutes of a match when a team is losing by a large margin. Only then will they start to throw the ball around in a desperate attempt to score quick tries. This is the only time that real attacking rugby is played: when the result is almost a forgone conclusion. In modern day rugby, you are rewarded for negative play because of the point scoring system. Why go for a 5 point try when you can score a guaranteed 3 points. If you are just inside you own half why not have a shot for goal? You may be rewarded with points and you haven’t even made it into the oppositions half. How many other sports operate like this? Not many. I don’t blame teams for playing safe, because that is how you win rugby games but it is boring. The crowd disengages. Why invest emotion in the game when you know your team won’t sustain attack especially if they are given an opportunity to score 3 points. How many games have you seen where the team that scores the most tries has lost? It is common occurrence in rugby but almost never happens in rugby league. When a Rugby team is chasing the win, they tend to play smart or safe. They believe that getting the ‘win’ is what counts. To some fans, maybe. But what most want is a display of skill. I would rather see my team go down fighting than playing it safe. I want to be entertained. If I switch channels to rugby league then I will see a team constantly attack an opposition goal line. Even after a penalty is given, they will still continue pressuring the goal line in an attempt to score a try. This is usually met with a cheer and from this suspense begins to build. If the attacking team scores the try, the crowd is rewarded for sustained pressure, but if the team is denied a try, the defense crowd rallies with cheers of support for a job well done. That’s entertainment. Rugby needs to be dynamic in their rule changes, they need to start respecting the fans. For example, the following is how rugby league deals with a problem of negative tactics:. This year, rugby league players began to kick the ball dead on purpose. This meant that the restart would be on the 20m line and the defense could set a solid defensive line. It effectively negated the kick return, which shut down the likes of Inlgis, Slater and Barba. This was a tactically smart play but it is negative and affects the flow of the game. Therefore, rugby league set about changing the rule so that if this option is taken the negative play isn’t rewarded. The quick restart rule was immediately put in place and in the off-season, a restart from the 30m line will be proposed. My point is that the administration realized that this kind of play was detrimental to the spectacle of the game. They know the fans come to see players with the ball in their hand, especially the likes of Slater, Inlgis and Barba. I would love to have a Kerry Packer in my back pocket because I would approach him and propose we introduce a new form of rugby in order to rescue the frustrated fans. Take on the IRB and lead a Rugby Revolution. I believe drop goals and penalties should only be used to break a dead lock. Especially drop goals. Do you know they still have drop goals in the NFL? How often do you see them use it? Never. You know why? Because it is boring and there are better ways to score points. Drop goals are a stain on the game. I hate watching games when you see a team attacking and after 4 phases, they take the attitude that they can’t score so they have a drop goal attempt. It is a game killer. ‘This means people will infringe more’. Yes, they will. But if you utilize a 5 minute sin bin (another new change) for constant infringements then all-of-a-sudden the infringing stops. Having 14 versus 15 players creates an increased advantage and would discourage frequent infringements. With this rule change I doubt we would see kicks from over half way, shots for goal when you are down 20-3 or even shots for goal as an opening score. If you have to kick 4 goals to better one try ,I guarantee that teams will opt for a try than going for a goal. There will be no more jeering from the home crowd under my rule. This means that a try would be worth 4 penalty goals and 8 field goals. I believe that this suitably rewards the teams attempting to score a try than opting for a penalty goal. Attacking Rugby is rewarded. I propose the flankers. This is my most controversial proposal. This would make the teams 13 a side. Almost immediately I can hear the purists screaming that this is too close to rugby league. Who cares that it is the same number of people, the games are vastly different. Why let rugby league predominate our decision-making, especially if it is for the betterment of the game. In the modern day game, all players spread out in defense and commit little to the ruck. It is almost impossible to break the line. With no attacking room and 15 men on the field, the game is stifled. If you were to drop the flankers this frees up more room up and also gives the fly half more time with the ball because there is no threat from the open side flanker. The other argument against this idea is that players will be doing more running and will become smaller to adjust to the quickness of the game. Because two men have been removed, the scrum will be lighter. This will mean that the remaining players in the scrum will have to maintain their size in order to control the it. If they sacrifice size, they risk losing the scrum in every instance. The lineout will always need tall men so the height requirements still remain in order to win the line out contest. Because teams will need to keep bulky forwards to win the set piece, this will also allow more room for the backs. At the moment with 15 men the bulky forwards don’t need to cover as much distance to defend and can therefore preserve their energy. With my idea, they need to cover more ground. This means they may grow tired and slow and therefore give the backs more room to move. Rugby league used to have a 0 meter rule defensive line rule which was then changed to the 5 meter rule and currently sits at 10 meters. This was designed to create more room for the players. It worked and resulted in exciting attacking play. Rugby needs to give the players more room. The best way to do this is to remove players. It is very simple. If you combine the change to the point scoring system and the removal of 2 men from the field, you will see some extremely attacking rugby and importantly more positive ‘on field’ decision-making. The reward for scoring tries will encourage an attacking mind set and reduce the amount of penalty goals and drop goals that are blight on the game. Essentially, the game will finally reward the attacking team. I would love to watch or play in a game of rugby with these proposed changes. It would be exciting, interesting and fun. Rugby has the potential to be the number one football code in Australia. The ARU just needs to implement drastic changes to modernize the current game. If this means splintering from the IRB then this may have to happen. Will leaving the IRB be the end of rugby union in Australia? Unlikely. Regardless, rugby is dying in Australia and is in dire need of a revolution. On this note I am packing up my desk, taking my favourite gold fish from the tank and walking out on Rugby. Who is coming with me? Well it didn’t work for Jerry MaGuire either. Couldn’t agree more. Something must be done and these are excellent solutions. Would be interesting to see what would happen to the scrum without flankers. I can’t help but think that they would fall apart. I like the idea but it may mean turning them league-style. In a way that would be a good thing cause scrum penalties are another thing killing the game, but on the other hand the battle between 2 skilled and well drilled forward packs can sometimes add to rugby…sometimes. I’d love to join you in your walk out; I’ve tried it before; but for some mad reason, I can’t. Well, don’t watch the game. Nicely said Johnny, and all perfectly valid. Perfectly valid, that is, if spectacle is the purpose of the sport. Just a bit of food for thought: What if public spectacle WASN’T the purpose? As kids we play cricket, football and all manner of less structured games in our own backyard for the enjoyment of it, and no other reason. Not to make mum and dad cheer. Not to make our friends want to come and watch. Not because it’s rewarding to observers, but because it’s rewarding to us as participants. I believe this to be the true purists view. The testing of this premise is easy enough. Chess would be more subscribed to as a spectator sport if some rules were changed, but the people who play it do so for the challenges and rewards in their own context without a thought for what observers may need in order to be more engaged with the game. Contest for the sake of the contest rather than the spectacle to observers. I played volleyball through high-school and represented the ADF at the Arafura games. The rewards of any team sport don’t need to be listed here, but how the game looked to people watching never entered my mind. If it had, I may have sought out a sport that had less personal benefit to me, but that put me on a larger stage. I agree that the waters become muddy when fiscal factors are thrown into the mix, when players need to be paid and when sponsors want maximum exposure through maximum crowd attendance and subscription, so from an investment point of view your argument is entirely valid and sound. But the real rewards in sport, for my money, lie in the playing. Not the watching. The day Rugby Union became openly professional the same pressures that brought about change in Rugby League came to bear on Union. The main difference being that the biggest obstacle to Union changing for the better is the presence of League. Perhaps the one change that would allow Union to keep its rucks, mauls, lineouts and competitive scrums whilst allowing more open play and more balance in terms of who actually contributes to a game is the reduction of the number of players on the field from 15 to 13. If the flankers are gone, then the options for running rugby are much better. The game doesn’t change in terms of rules, thereby keeping its unique characteristics and if there’s more running around and scoring tries then it becomes more entertaining both for the players and for the spectators. I know I am a bit late on this but stumbled on it by chance today and found your comments interesting but not applicable to any other country except Australia. The new conference structure in Super rugby was brought in for one thing and one thing only. To give you aussies an advantage. Because the game does not enjoy as much favour and support in Oz as it does in SA or NZ. The game is alive and well in those two countries. Me being a Bull supporter I urge you to have a look at our fans. We love any points whether it’s 3 for a shot at goal or 5 for a try. This is Rugby union and to try and change it so that it can compete with league just because you aussies prefer is laughable. I do agree with you that maybe they should relook the points scoring table. In sa on Varsity level you get onlt two points for a drop or penalty goal. five for a try plus two extra for the conversion I think they should adopt this at all levels. Excellent thoughts! But the changes should be more profound. A major weakness in rugby is the lack of proportionality in the rules. Under natural justice the punishment should be proportional to the infringement. For a minor offence in rugby the sanction is a penalty kick which typically results in 3 points. It’s too higher price to pay for so many relatively minor offences. Why not resort to free kicks? They’re quicker and don’t provide such a high punishment. Game would flow much better. Another thing is playing the advantage. It goes on too long and there’s too high a level of advantage required. For a penality offence the disadvantaged team must cross the advantage line in possession. This is excessive. Again the issue is proportionality. A fundamental issue is the refereeing culture. I know 2 quite senior refs and they are interesting individuals. Hugly rule focussed with no common sense. No focus on encouraging a free flowing game. Only intrested in finding faults. If you seriously want to free up the game think about the knock on rule. Why stop the game for an accidental knock on? Yes I know hardened rugby people wil cringe at the thought of not penalising a knock on, but stop and think about it. Fumbling the ball is sufficient disadvantage to the person in possession. To also stop the game and give the other side a put in to a scrum is excessive and slows the game. Silly! Rugby should be the best of all games. The ancient challenge of 2 teams of burly blokes wresting each other for dominance is so fundamental. However the rules of rugby spoli the game. Point of correction (as an American): The reason the Dropkick is hardly ever used in the NFL is because the dimensions of the Football have been changed in order to facilitate the Forward Pass. The tighter dimensions meant a ball with pointier ends, which made it a lot more difficult to execute a Dropkick — not impossible (see: Doug Flutie’s kick for the New England Patriots: http://www.youtube.com/watch?v=2S_7TT2a1H4), but harder to do. The dearth of Dropkicks in the NFL actually argues AGAINST you, since NFL coaches would always prefer the almost-certain Field Goal from a Placekick, rather than the uncertainty of a player trying a Dropkick. Also, the problem with Union is that there is no reliable way to maintain possession: A teamc works its way down to the Goal — and, then, loses the ball in a ruck or maul. Of course, any team is going to choose easy points via a Field Goal, instead of trying for the Try (no pun intendeded) and possibly losing possession of the ball. The NFL and RL figured out this problem a long time ago. RU has not. Indeed, if RU did, then it would be like conceding the League was right all along to scrap the ruck/maul procedure. I don’t agree with much of what I read. Yes, scoring tries is the main goal of playing rugby. Always has been. But unfair play and tactics need to be punished. Plus I have seen, mostly from New Zealand refs in international matches over the years, the failure to play advantage, therefore blowing up play and awarding a penalty when the non-offending team was about to take off on a movement down the field: Scotland v England in 1990 was one of the worst examples, and John Pring did it a few times to the British Lions in 1971. So there’d be an opportunity for more tires scored if advantage was played correctly, and refs didn’t use the whistle too fast. I see a big problem with these static rucks. They are stupid! Because of law changes in the early 90’s, defensive rucks aren’t done anymore. Maybe two defensive forwards get into the ruck, and team with possession has their forwards, maybe three or four, heel the ball back to the half back or acting half back, who spends about 30 seconds looking around for I don’t know what, while the defense fans across the field like in rugby league! So the midfield is cluttered with players and there’s NO SPACE! How can a try be scored with NO SPACE! I believe the “use it or lose it” law should be applied, or re-interpret when a ball is out of a ruck, like if it’s at the rear foot, it’s out and the defense can charge across the offside line. And go back to the old laws regarding mauls and rucks prior to 1993. I suggest taking a look at some of the international matches played in much of he 50’s, 60’s, and 70’s, when a tackled player HAD to release the ball IMMEDIATELY, without rolling around on the ground, or squirming his or her way in order to face his own team, and placing the ball back with hand on the ball! Since the late 70’s or early 80’s, despite what the law book says, it’s basically okay to hang on to a ball in a tackle up to two seconds. In the old days tackled players just let go of the ball, or batted it back in hopes that one of their own team would be there in support. A ref would penalize anyone holding on to the ball as they have done the last few decades. There was much more back and forth play, not like now where there’s almost a “guaranteed” possession of the ball, as in American football. And with that back and forth play, there were tries scored from opportunities that would present themselves in loose play, not set play so much. Regarding scoring: nothing wrong with a drop kick. How about this: make a placed kick conversion only worth one point, and a dropped kicked one two? Same with a penalty kick: placed it’s worth only two, dropped and it’s worth three. That would make captains think about their options. Lastly, it’s about time backs learned how to grubber kick and pop kick again. Barry John was an expert at it! One cant’ just score tries from running the ball in hand, and heck, I’ve seen way too many forward passes not getting called, like in the last minutes of that NZ v Ireland match last November 2013! Seems back and forwards have forgotten how to set up in support behind runners so that passes are correctly done. To. Continue…the. Game. Finished with. The. Award of. The. Penalty try..What for…to many rules …five. Penalty goals. In the first. 12. Minutes.,,isn’t the game. About. Tries……??? ?